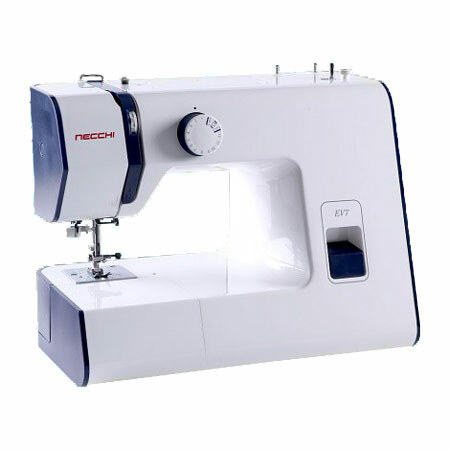 The Necchi EV7 is a basic compact style sewing machine for sewers of any age or experience. The compact design takes up less space on the table and makes it easier to take along with you to your favorite sewing classes. The onboard storage compartment keeps your extra bobbins and sewing machine feet right where you can find them. This well designed sewing machine includes useful features such as a built-in needle threader that makes threading the needle a snap. The EV7 also includes 7 essential stitches and a 4-step buttonhole. The presser feet slide on and off making them simple to change. Easy conversion to a free arm lets you hem your pants or get to the cuffs of a shirt with ease. This Necchi EV7 includes a FREE 1/4" foot. This is not packed with the machine by Necchi. We are offering it as a promotion.